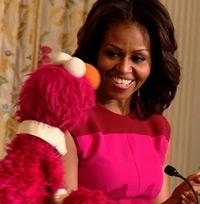 In support of First Lady Michelle Obama's "Let's Move" initiative to reduce childhood obesity rates, the nonprofit Sesame Workshop has agreed to waive its licensing fees for two years so that its "Sesame Street" characters can be employed to help market fruits and vegetables to kids. Sesame Workshop and the Produce Marketing Association (PMA) joined the Partnership for a Healthier America (PHA) in the agreement, which will allow PMA to use Sesame Street characters like Big Bird, Elmo, Rosita and Abby Cadabby on in-store signage and labels on individual and bagged fruit and produce items. The First Lady and PHA CEO Larry Soler announced the new program, which could begin rolling out as early as mid-2014, during an event at the White House yesterday. PHA is a nonprofit formed to support the Let's Move campaign. The announcement is the first since Mrs. Obama held the first White House "Convening on Food Marketing to Children" in September, during which she called on food and media industry executives, advocates, parent leaders, government agency representatives and researchers to collaborate to accelerate a shift to marketing healthier food and beverage products to kids. The new Sesame Street/PMA efforts are "so incredibly important, because right now, when it comes to marketing food to our kids, as you all know, the deck is stacked against healthy foods like fruits and vegetables," the First Lady said. "But while Sesame Workshop and PMA might be the first to answer our call, there is plenty of work left to be done, and there are plenty of different ways to show leadership on this issue. So I am looking forward to celebrating more companies and more organizations as they step up on behalf of our children." Sesame Workshop agreed to the unusual move of waiving the licensing fees for the Muppets – a major source of income for the nonprofit – as another way to extend the healthier-eating messages that are incorporated in the "Sesame Street" television show, Sesame Workshop EVP, CEO Sherrie Westin told The Washington Post. "It would be a shame not to use [the characters] to that end," she said. Following the announcement, the First Lady and Let's Move executive director (and assistant White House chef) Sam Kass and some of the Muppets participated in the White House's Kitchen Garden Fall Harvest. Students from the District of Columbia, Virginia, West Virginia and Maryland harvested and prepared vegetables from the garden located on the White House's South Lawn. Let's Move pointed out that the schools that participated in the Harvest are making healthy changes such as ensuring that kids have healthy snack options — and that all schools will be required to follow the U.S. Department of Agriculture's new "Smart Snacks in School" nutrition standards starting with the 2014-2015 school year.